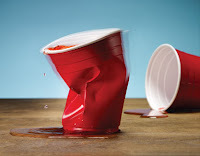 According to Emily Listfield in her June 12, 2011, Parade magazine lead article, "The Underage Drinking Epidemic," every year more than 1,700 college students die from alcohol-related incidents. This is more deaths than the number of U.S. soldiers who have died in Afghanistan during the 9 years the U.S. military has been involved there. Every year. Kids. In college. More than 5 times as many DEATHS per year from using alcohol to have a good time than troops in the combat zone dying from I.E.D.s, suicide bombs and gunfire. A similar alcohol-related tragedy happens 1,700 times every year. The article does a great job of stating the problem, but it fails to explain why young people do this. These articles almost never do. Even Dr. Oz's new book, You: The Owner's Manual for Teens, fails to mention the main reason why teens do things that will endanger their lives. I've explained this before, but in the context of the Parade article, I feel I need to do so again. The real reason kids fail to use good judgment with alcohol is that the part of their brain that handles foresight and critical judgment - the prefontal cortex - is "under construction." At the onset of adolescence, the final stage in human brain development begins. And it affects only one part of the brain - the prefrontal cortex. This is the part of the brain that handles what we know as "intellect" - understanding of cause and effect, judgment, planning, and self-control. This part of the brain, more than any other, is what distinguishes humans from all other species. It's the part of the brain that looks at a situation and says, "Uh-oh. This is really risky. Not worth it. No way am I going to do that." As with every area of brain development, it starts with "blossoming," the rapid growth of many times more brain cell connections than an adult human will ever need. This over-growth makes use of the prefrontal cortex in decision-making difficult. Faced with a risky situation, an adolescent is likely to use the amygdala instead, a more primitive part of the brain that forces decisions based on emotion. After this initial blossoming, each time a young person uses critical thinking, the brain cells involved will strengthen their connections. As brain scientists are fond of saying, "neurons that fire together wire together." Eventually, the unused connections die off. This phase is called "pruning." By the time adolescence is over, at age 22 (plus or minus), only the connections that have been used repeatedly will remain. While learning is still possible throughout adult life, these remaining connections will form the foundation for future intellectual growth. Do I need to say what happens to a young person who rarely uses critical judgment during adolescence? Like all phases of brain development, it's "use-it-or-lose-it." It's also a "Catch-22" situation. For a teenager, using that part of the brain is a problem. They are discovering their independence, so they frequently put themselves in situations where they need to use critical judgment. But doing so is difficult for them. Remember? That part of the brain is under construction. That's why kids need constant adult guidance during adolescence. And then there are the under-age binge drinkers who did not die. Well, I've got news for you. They may have dodged the death bullet, but they probably didn't dodge the others. The impaired decision-making that leads to death can also lead to injury. The first bad decision is to hoot it up drinking with friends. The next bad decision is to get into cars. Use your imagination a little bit to visualize what happens to a teenager when the vehicle they're in leaves the highway and flips over several times before crashing to a stop. This actually happened not long ago on Loop 1604 outside of San Antonio. The driver, 18-year-old James Patterson, who was drinking at a pre-graduation party, was killed. His three passengers survived, with serious injuries. I read about these stories every week. Patterson was one of 366 teenage drivers killed in Texas that year. As Listfield points out, under the influence of alcohol, teens are "much more likely to be taken advantage of sexually or to take advantage of someone else." All this is shocking, but here's the worst part. The article cites Dr. Fulton Crews, director of the Bowles Center for Alcohol Studies at the University of North Carolina School of Medicine: "Adolescents showed much more frontal cortical damage than adults." If a child is exposed to alcohol or drugs during a sensitive period of brain development, it can damage that part of the brain. Teens binge drinking during the sensitive period of prefrontal cortex development are likely to retard development of that critical area. Cause: excessive alcohol consumption. Effect: permanent brain damage in the area of the brain that handles intellect. That's a sobering consequence. Most people don't think about this in connection with teen drinking, because they have no idea that this crucial aspect of brain development is even happening. Well, if you've read this far, you know now. On page 12 of her article, Listfield lists some things parents can do. I like her recommendations. Translation: whatever you say or do, be guided by your unconditional love for the child. But above all, help them do the critical thinking. Coach them about cause and effect. Because I promise you, it is highly unlikely that they're capable of doing this for themselves. Could my brain still be "under construction" at 45? Laugh. Seriously, this was a great post. I certainly drank too much while away at college.